Home > News > Unofficial Record Store Day at Bookmans! 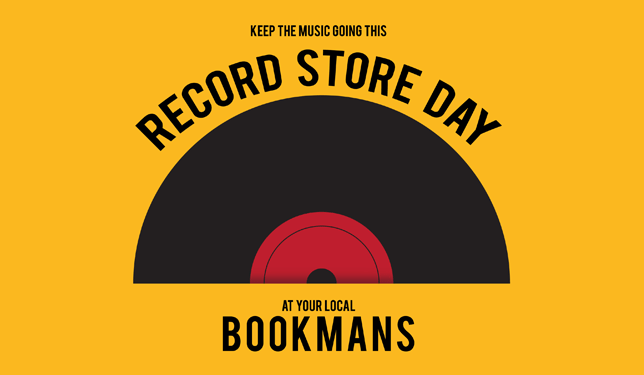 Bookmans stores may not be official Record Store Day event stores, but we are definitely the go-to music and vinyl destination for thousands of people in Arizona. That’s why we want you to join our stores after you grab your Record Store Day releases and enjoy something a little different. We’ll actually be celebrating music and vinyl with our Unofficial Record Store Day events on April 13th! Bookmans East welcomes DusTone Electronics, a local musical instrument provider, who can’t wait to show you their pedals from 12:00-2:00. From 12:00-2:00, enjoy the ambiance as we play music on vinyl, and you can win a Bookmans Record Store Day gift basket! Know a lot about music? Try your luck in our Name that Tune Trivia event! You can try your luck over at our Mesa store too! With every record purchased on April 13, you will receive a chance to win a $100.00 Bookmans gift card! How can this get any better? There is no limit! That’s right! The more records you purchase, the greater your chances of winning are. There’s also a Ukulele Party so you can jam acoustic-style! At Bookmans Midtown, DJ Circuitous Vibes will be creating amazing ambient music for all. While supplies last, come make a mixtape on us or for us and paint your heart out using recycled vinyl records instead of canvas! Then at 6 PM, the Vinyl Preservation Society of Arizona is coming by for a social spin with DJ Zona. Drop the needle on your favorite album you brought or borrow from our borrow crates during the event. Bookmans Phoenix is teaming up with local Phoenix artist Sabree to create a one-of-a-kind art piece that reflects the community of music lovers. Inspired by the days of analog into digital, she will use mosaic tiles from vinyl records to create something special – and we want you to help! She’s looking forward to collaborating with the community to generate art for all skill levels. The finished piece will be lovingly displayed at Bookmans Phoenix. Plus, you can be entered to win a $100 Bookmans Gift Card for everyone LP purchased. AND, author Michael Crawford will be signing copies of his book Indie 101: How to Maintain a Band and Start Your Own Record Label. Music lovers won’t want to miss a moment! Our Flagstaff store wouldn’t miss out on all the fun! Local favorite and celebrated DJ Knomadik, of The Brothers Funk, will be spinning choice cuts of old soul and classic funk records live in store from 5-7 PM. Peruse our thousands of records while getting down to some James Brown. Bookmans Cafe barista and local artist Ben Craigie will be using recycled vinyl records to create a custom sculpture for Bookmans Flag celebrating the Vinyl Revival. Watch Ben assemble the sculpture at Bookmans Flag as we unveil this incredible work of art to customers and staff. In Tucson at Bookmans Northwest DJ Jam-Is-On will also be spinning records in-store. There’s also a Name that Tune trivia event from 1-4pm. Answer correctly and win Bookmans gift certificates and merchandise! Plus, you can enter to win an RSD Bookmans Gift Basket! We’ll see you all April 13 for our UnofficialRecord Store Day!